Blackberry bushes have many desirable qualities. They are very hardy plants and prolific producers of high-quality fruit. In fact, blackberries are one of the most popularly planted fruits in home gardens, according to the University of Tennessee. Blackberries are commonly divided into two large groups according to their growing habit, which can be either trailing, erect (shrub-like) or semi-trailing. There are several varieties and cultivars within each group. 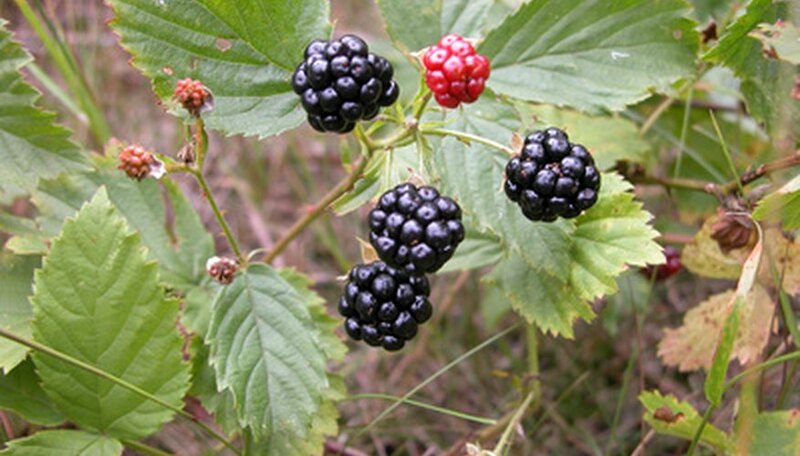 In general, blackberry bushes grow in United States Department of Agriculture (USDA) zones 5 through 10. "Black Satin" is a mid-season blackberry. The blackberries on this type of bush are ripe from late July to early August. These berries are known for their large size and very black skin. They have good flavor, according to Oregon State University, and are a particularly hardy and vigorous variety of blackberry. In addition, the canes are thornless, making this an excellent choice for a home garden. "Choctaw" is a Southern blackberry that can be damaged by late spring freezes. Otherwise, this type of blackberry bush is desirable for its early harvest (July) of fruit that has small, almost unnoticeable seeds. These bushes produce a lot of berries, according to North Carolina State University, that have a sweet, mild flavor. Unlike many blackberry bushes, this variety, which grows erect and does not need support, remains a manageable size even as it matures. Unfortunately, this comes with a price, as the bushes are very thorny. "Hull" blackberry bushes feature large, very firm berries that are excellent for storing purposes. These are mid-season berries. Their tough quality and good flavor make them a popular choice among home gardeners who want to freeze the berries or sell them. Hull bushes are also very hardy and thornless. They are of the semi-erect variety, which means they will need a trellis to support the heavy, spreading canes. "Ollalie" is a rare type of blackberry bush that only survives along the coastal areas of the Pacific Northwest, according to Oregon State University. Often found growing wild in the wet forests, these large, glossy black berries have an excellent shelf life and ripen mid-season. The plants themselves are vigorous growers and produce multitudes of berries. "Triple Crown" was introduced by the USDA in the mid 1990s, according to North Carolina State University. The berries are huge and shiny, with an excellent flavor. They ripen late in the season, at the end of August or beginning of September. This semi-erect variety has a high yield and is thornless.